Vbet Sports affiliates earn 50% revenue share on what their players spend at casino, live casino, FinBet, Pools betting and live sports betting. Vbet is a respected, loved and trusted online gaming operator. They have been expanding rapidly but there is no sign they are planning to stop. For any questions regarding the payment methods accepted, currency options but also any technical issues, members are expected to contact the customer support. They are reachable 24/7 via live chat, email and telephone, with only players from Armenia benefiting from toll-free numbers. Vbet has established a strong presence over the Internet and relies on social media to improve brand recognition and support can also be contacted on Facebook, Google + and Twitter. Vbet was founded in 2003 in Armenia and since then has gained many players’ trust. They were firstly known as Vivarobet, before opting for the shorter and easier to remember Vbet. The Armenians have now they have offices in Malta and in Armenia (main offices) and they are licensed in the United Kingdom, Malta and Curacao. 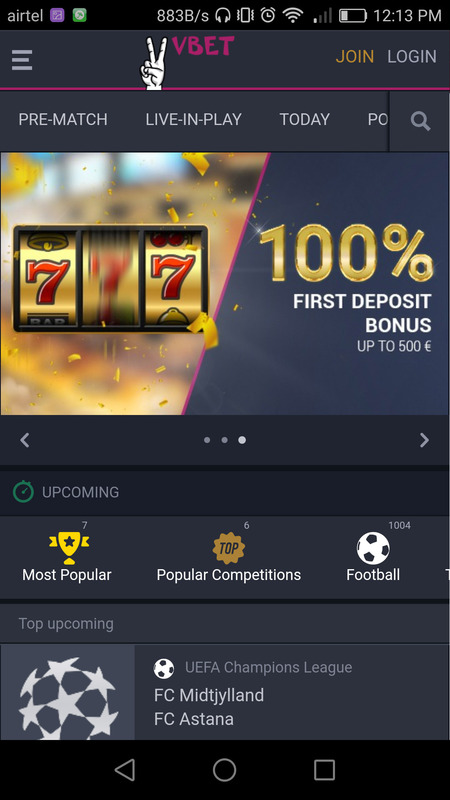 The Vbet sports betting platform is provided by the parent company Betconstruct, one of the leading software providers in the industry. The huge number of 43 sports that is provided can excite every punter, while the football lovers will be satisfied by the great variety of alternative bets. These can reach up to 160 at every football match. A wide range of Asian Handicaps are available, whilst the payout is competitive, it reaches 95.1% at football and an average 94.1%. Vbet do not currently have a traditional sign up bonus or welcome offer. The majority of sportsbooks provide customers with an enticing welcome offer of free bets or a 100% sign bonus on an initial deposit for an amount that can range from £100-300 depending on the bookie. While there is no Vbet bonus currently available, we are assured that a bonus offer for new Vbet customers is not too far away. As soon as the Vbet bonus offer details are known, we will let you know how you can claim your welcome bonus. Vbet’s lack of a welcome bonus is certainly lamentable, all is not lost: everyone loves a quiz, and when that quiz involves cash prizes it’s even more fun! In Vbet, the popularity of the sport dictates the amount of betting markets. However, if you search through the website, you’ll be surprised at how large the coverage for most markets still is. Find out more about Vbet’s sports betting below. The vast array of sports in Vbet include Football, Tennis, Basketball, Volleyball, Ice Hockey, Baseball, Handball, Table Tennis, American Football, and Badminton to name a few. Among its niche sports are Ice Hockey and Football. Because the bookmaker was initially targeted on the Eastern and Central Europe customers, it is not surprising that the sportsbook has a selection of matches in them. The depth of the matches available makes Vbet a solid competitor to those offering the same market. Although the selection of sports at Vbet is excellent, this bookie’s odds are not sky-high. While it’s true that it offers consistently higher odds for Ice Hockey, Football, and Boxing, the bookmaker still loses against stronger competitors when it comes to its maximum stake. The bookmaker, however, tries to compensate by offering a minimum bet of as low as 10 cents. This means more can play, although punters cannot expect the highest returns if they win. 15 years ago Vbet was born. At first as a sportsbook, the company looked to offer the best odds in a range of sports. All these years later, Vbet is a respected online gaming brand with millions of customers betting on sports, poker and casino every day. Not only there is a range of services that your players will never get bored of exploring, Vbet Sports has many amazing features like a Calendar of upcoming sports events, customizable Live Score Multiview, Free Quizzes with real prizes, a dedicated mobile app and more. Vbet Sports is superb for desktop as well as mobile. Specifically, for mobile betting Vbet has created a separate platform Mobile.Vbet.Com. But perhaps the easiest way to bet on-the-go is through Vbet Sport mobile apps for Android and iOS.